The Partnership for New York City was formed out of the merger of two organizations: the New York Chamber of Commerce and Industry and the New York City Partnership. Although the Chamber remained sufficiently loyal to the Crown to have received a royal charter in 1770 from King George III, many of its founders including the first president, John Cruger, were early leaders of the patriot cause. When war broke out, the Chamber’s loyalties were split and a number of members fled the city with George Washington’s retreating army. 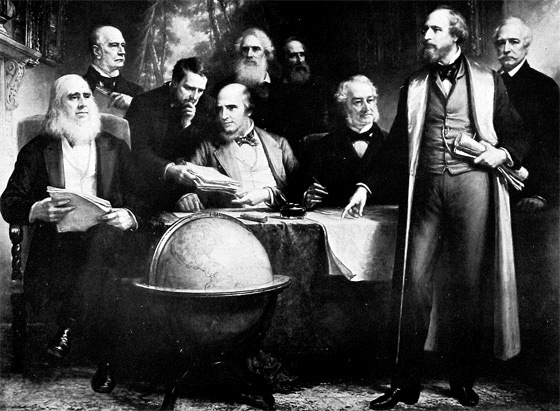 After the war, President Cruger and others returned and petitioned the New York State Legislature to confirm their original charter. 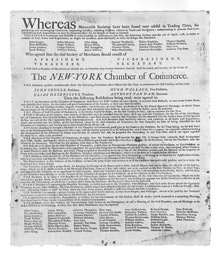 In response, the Legislature passed a law on April 13, 1784, entitled “An Act to Remove Doubts Concerning the Chamber of Commerce and to Confirm the Rights and Privileges Thereof.” The corporate name was changed to “The Chamber of Commerce of The State of York,” and the new organization held its first meeting on April 20, 1784. The early Chamber helped lay the first transatlantic cable, construct the city’s first subway line, and build the system of aqueducts that still brings drinking water from the Catskills. It also proposed the Erie Canal, the success of which made New York the link between the new western economy and the maritime ports of the east and abroad. This was the single most important factor in making New York the preeminent commercial and financial center it is today. Among the Chamber’s past leaders are legendary New Yorkers with names like Bayard, Murray, Astor, Hicks, Fish, Cooper, Morgan, Vanderbilt, Carnegie, Schiff, Edison, and Rockefeller. Following in the tradition of three generations of Rockefellers who were closely associated with the Chamber, David Rockefeller transformed the organization in 1979. In that year, he founded the New York City Partnership and affiliated it with the Chamber. Although the original Chamber had taken a broad look at what it considered to be “business interests”, it was primarily a business advocacy group. Under Rockefeller’s vision, the new Partnership would allow business leaders to work more directly with government and other civic groups to address broader social and economic problems in a “hands on” way. In 2002, the New York City Partnership and Chamber of Commerce became the Partnership for New York City, an organization whose mission is to enhance the economy of the five boroughs of New York City and maintain the city’s position as the global center of commerce, culture and innovation.